During President Obama's trip through upstate New York this week he is bound to be greeted by fracking protesters from both sides of the issue. On one side are the folks who want to make sure that they have clean water to drink, clean air to breathe, and enjoyment of the property they have invested their life savings and lifework into. Some of these folks live in towns, some on farms. Some are landowners, some not. But they all have one vision: fund renewable energy research to get us off the fossil fuel fix we're stuck on. And, based on recent surveys, they represent close to half of the population of the state. 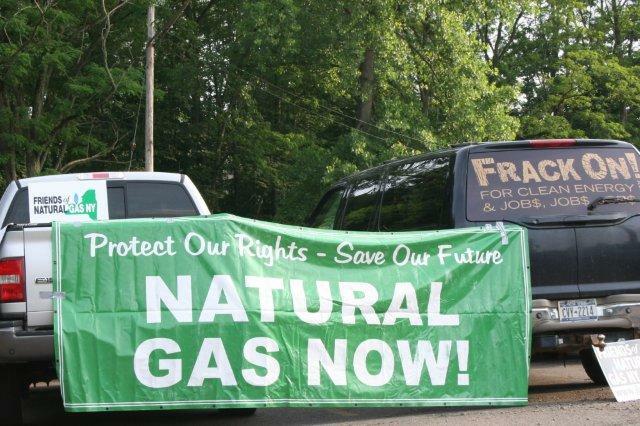 They plan to show up in Binghamton - the "epicenter of fracking debate- on Friday. Their message: that it would be irresponsible to permit shale fracking anywhere in NY, and particularly in the Southern Tier, without comprehensive public health protection and clear liability standards. "We need a study of public health harm before this practice is allowed," says Walter Hang of Toxics Targeting. "That should be our national policy." On the other side are folks who really, truly believe that we can drill our way out of debt and poverty. They see fracking as a way to "save" the family farm- despite evidence to the contrary and the recent findings that gas companies are reneging on royalties in PA. They are planning a huge rally/picnic on Friday. An email sent out to members of the Joint Landowners Coalition of NY invites one and all to Otsiningo Park's north pavilion from 10 am - 4 pm for music, movies, speakers and maybe even some catered food - but bring a dish to pass. "Please bring signs, banners, billboard mounted on trucks. Bring as many as possible!" says the memo. " This is the only chance we have to show President Obama just how many of us there are and how strong our support is..."
Tomorrow should make for an interesting news day in Binghamton.